Strange and Stranger: the World of Steve Ditko was published in 2008 by Fantagraphics Books. Author Blake Bell traces the life story of this legendary and reclusive comic book artist over six decades, using dozens of illustrations and interviews with the people who once worked with Ditko. Anybody who loves comic books, and especially Spider-Man or Dr. Strange, will find this to be a fascinating tale. The ISBN for this book is: 1560979216. Steve Ditko is probably the most enigmatic and complicated of all comic book artists. He helped make the Amazing Spider-Man the pop-culture event in the 1960s that helped revolutionize comic books, and created the mystical worlds of Dr. Strange. He famously walked away from Spider-Man at the height of its popularity and over the decades has maintained a career that is marked by few public appearances or interviews. Author Blake Bell, in providing details of Ditko's childhood lays the ground for the rather off-the-beaten path that Ditko would take, first at comic book companies like Charlton in the 1950s through a bizarre journey of confrontations and imagined betrayals as objectivism began to loom over his work more and more. Strange and Stranger's 220 pages are packed with lots of artwork from throughout Ditko's 50+ years in comic books, and the large size of the book -- 12.2 inches by 9.2 inches -- really makes the illustrations stand out in full color. Strange and Stranger has gotten rave reviews from Amazon readers, so you may want to scroll through their comments before ordering! Steve Ditko's greatest contribution to comic books was his vision of Spider-Man, of course. Marvel Comics editor Stan Lee, having launched the Fantastic Four with Jack Kirby, asked Ditko to help him develop Spider-Man after deciding that Kirby's version of the character didn't work. Ditko gave Spider-Man his costume design and developed the look of the series, which was very different than the usual Superman and Batman comics of the day. Eventually, Ditko would take over the plotting of each Spider-Man comic as well. Even though I knew the general story behind the creation of Spider-Man, Blake Bell weaves a strong narrative about that chapter of Ditko's life, neither making him the hero or the villain of the dispute with Lee. He brings up details that I had never heard -- like readers' reaction to Aunt May and what Lee wanted to do with her. If you are a real fan of Spider-Man, you will find this chapter absolutely fascinating, and cringe at the thought of what might have been if Lee had had his way on some things. Stan Lee, in his latest book, says he ''jazzed'' by Ditko's approach to stories but that tension emerged during their collaboration on the Amazing Spider-Man series because their story instincts diverged. ''The challenge for me was to find out what he wanted,'' Lee writes in Stan Lee's How to Write Comics. The book includes some paragraphs from an old interview by Ditko on how he worked, as well as many pages of observations about writing comics by Stan Lee. The contributions of Stan Lee and Steve Ditko to the creation of the Amazing Spider-Man and the wild success of the comic book series have long been disputed by the two men, with Lee at times saying he was responsible for innovations that Ditko felt he should get credit for inventing.The rift between the two creators reached the point where they stopped talking to each other sometime before issue No. 25, and after Ditko left the series after issue No. 38.
Who do you think contributed the most to the success of Spider-Man? While Strange and Stranger is the definitive biography of Steve Ditko, his artwork has been collected in numerous volumes. Here are a few that you might like. It's The Art That Matters! 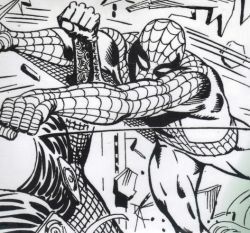 Much has been written about the dispute between Stan Lee and Steve Ditko over the creation and direction of Spider-Man, and about the way Ditko's personal philosophies have gotten in the way of his telling a good story. But no one can deny that when he was at his best Steve Ditko was one of the most creative and interesting artists working in comic books, especially during the 1960s. This Dr. Strange scene from Strange Tales No. 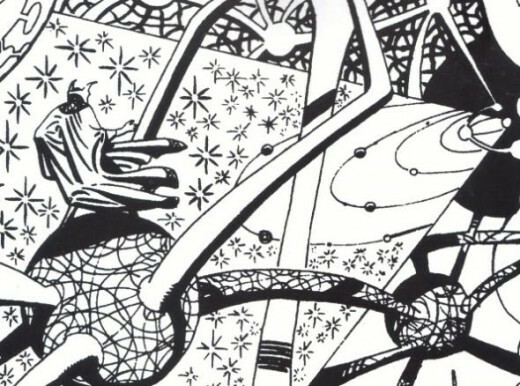 138, reproduced in Bell's book, shows just how otherworldly Ditko's art could be. His art was so different from everyone else's that many 1960s readers suspected he was doing the same drugs that hippies used. Ditko is one of the proponents of objectivism, a philosophical system developed by Russian-born author Ayn Rand that advocates reason and rational self-interest as man's guiding lights. 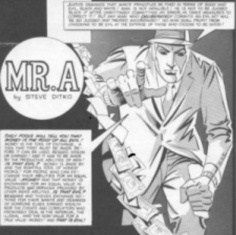 While Ditko sprinkled smatterings of the philosophy in the Amazing Spider-Man stories that he did, he later created Mr. A to embody objectivism. 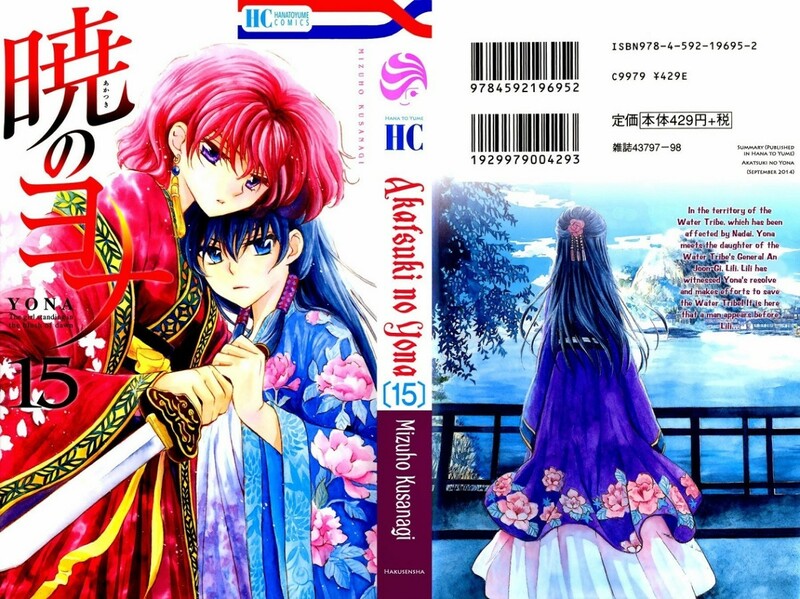 The character argues that the world is black and white, with no gray moral areas. He first appeared in 1967, and in truth many of the Mr. A stories that I have read haven't been that entertaining because of the philosophizing. The illustration here is a panel of Mr. A from his first appearance in 1967's Witzend No. 3. Where Does Steve Ditko Rank? Steve Ditko greatly influenced many artists and writers that came after his heyday in the 1960s, but where does he rank now among all the comic book giants? I'd probably rank him right behind Jack Kirby in the pantheon of Marvel artists, and among the top 5 in the past 50 years. Your thoughts? Where Does Steve Ditko Rank as a Comic Book Artist? Ditko is in a league of his own! No one comes near! Ditko is definitely part of the comic book artists' Mount Rushmore! Ditko was great for his time but can't compete with today's artists! Ditko was always over-rated! I never understood why people liked his work! Steve Ditko's Early Spider-Man Stories in One Book! Steve Ditko's greatest contribution to comic books was the world of Spider-Man that he created from the superhero's debut in Amazing Fantasy 15 to issue 38 of The Amazing Spider-Man. Marvel Comics collected Spider-Man's debut and the first 10 issues of the Amazing Spider-Man in one book called Marvel Masterworks: The Amazing Spider-Man Vol. 1. I wrote about it in a separate lens, so if you are curious to find out more about Steve Ditko and his contribution to Spider-Man please visit it! Stan Lee on a Famous Steve Ditko Moment! Here's a short interview of Stan Lee talking about one of Steve Ditko's most-famous pieces of work on the Amazing Spider-Man series. Thousands of Comic Book Fans in One Place! My daughter and I were able to attend the New York Comic Convention in New York City in October, 2011, and wrote a review of our day there. It was a blast, and we highly recommend a visit to the convention next year for any true comic book fan! My Comic Book Lenses - Fantastic Four, Hulk, the Avengers and Many More! If you are ever in Baltimore check out Geppi's Entertainment Museum for one of the greatest comic-book collections on display anywhere. See my lens for more details on what you can expect during a visit! Here's your chance to discuss the book, Steve Ditko or anything else you may want! Spider-Man in the 1960s: Dr. Octopus, the Vulture and the Debut of the Kingpin! Spider-Man In the Early 1960s: The Green Goblin's Debut, Plus Daredevil and the Hulk! Fascinating! I added a link to this lens in my article "I'm the Biographer Bookworm on Squidoo." Good to see an Ayn Rand admirer. I remember the early Spiderman comic books. Steve Ditko gave the character a very unique look and personality that was refreshing compared to the totally boring Superman and Batman. ALthough I've never heard of Steve Ditko, this was interesting. It's often the case that creative partnerships die a horrible death. Very cool Steve Ditko lens! You are definitely a true fan! Amazing lenses! You really know your niche. I used to love marvel comics when I was a kid, haven't read them for years tho'. interesting and informative lens. Ditko was the definitive artist of Spider-Man. Every artist who ever did the comic tried to copy his style. 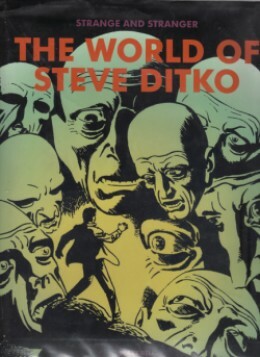 This is a great lens on Steve Ditko and I will share it with my friend who is a big Ditko fan. Also thanks for liking one of my lenses.